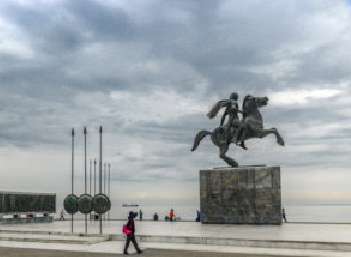 Visit the land of Great Alexander in a 7.000 years journey of Greek history! Macedonia was and will remain Greek. Great Alexander, born in Pella, made Macedonia huge. History cannot change. Free pick up service starts at 07:30 am and is included. (See the list in the footer). Departure from the terminal on Amalias Avenue 24 at 08.45 a.m.
Day 1: Leave Athens and driving by the towns of Thebes, Levadia and the traditional village of Arachova, arrive in Delphi. Visit the famous oracle of the ancient times, the Temple of Apollo, see the Treasury of Athenians and the archaeological Museum where sculptures such as the Sphinx, the athlete Aghias and the bronze Charioteer are exhibited. After lunch depart for Kalambaka the modern town at the foot of the gigantic rocks, the famous Meteora. Dinner & overnight. Day 2: Spend the morning visiting two of the Byzantine monasteries, built by the monks seeking protection at the top of the rocks. Meteora means “middle of the sky” and the monasteries seem to be suspended in the air. You will visit ageless monasteries and you will see unique specimens of Byzantine art. Depart from Kalambaka for Thessaloniki, the second largest city of Greece (dinner & overnight). Day 3: In the morning you tour the city that during the Byzantine Empire rivaled Constantinople. Visit the Museum of Byzantine Culture and a couple of the most characteristic churches of the Byzantine world. The rest of the day you are free to explore the beautiful city. Dinner & overnight. Day 4: Departure for historical Macedonia. Stop at Edessa, the city with the famous Waterfalls. Second stop is Naoussa where you will visit the school of Aristotle. Here the great philosopher taught morals and politics to Alexander the Great and other Macedonians. Next stop is Vergina (the ancient Aigai). Here you will visit the royal tombs of Macedonia and among others the tomb of King Philip II, Alexander’s father, and enjoy an unforgettable visit to the unique museum. You proceed to Veria (Biblical Berea), a town on St. Paul’s steps in Greece. See Paul’s Bema and stroll through the old Jewish neighbourhood and the market area, before returning to Thessaloniki. Dinner & overnight. Day 5: Visit the capital of Alexander the Great, Pella and see the exquisite mosaics of the 4th century villas and the new Museum. Next stop is the Archaeological Park of Dion, the sacred city of Macedonians located at the foot of Mount Olympus, the residence of the 12 Gods of the Greek Mythology.